So on September 14, 2011 I had a chance to explore these issues. I joined a discussion along with 30 other people led by Dr. Peter Jones at Design with Dialogue that asked “Can a powerful question change the world?” We started our discussion with the question “What question is burning to be asked in your life right now?” Although simple enough, we wondered how this question worked for us and spent some time doing other exercises before we explored it further. 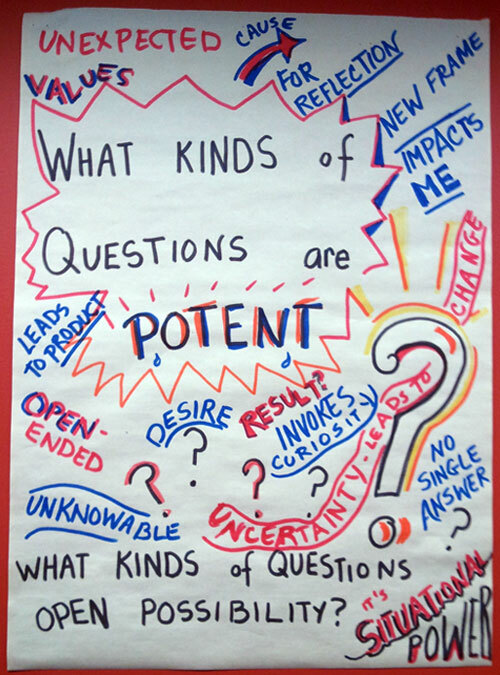 During the DwD session we practiced different methods of exploring the impact of what powerful questions could produce. The session was divided into three separate challenges. The first one was called the question game, in which participants engaged in conversations that were entirely made from questions. The second challenge was to look carefully at the process and practice of asking questions. 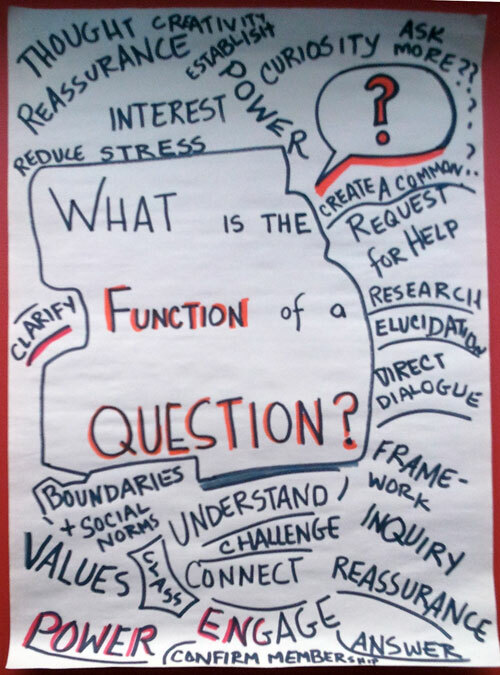 The third and final challenge was to explore how questions might direct a purposeful, intended response. 1. What is the function of the question? 2. 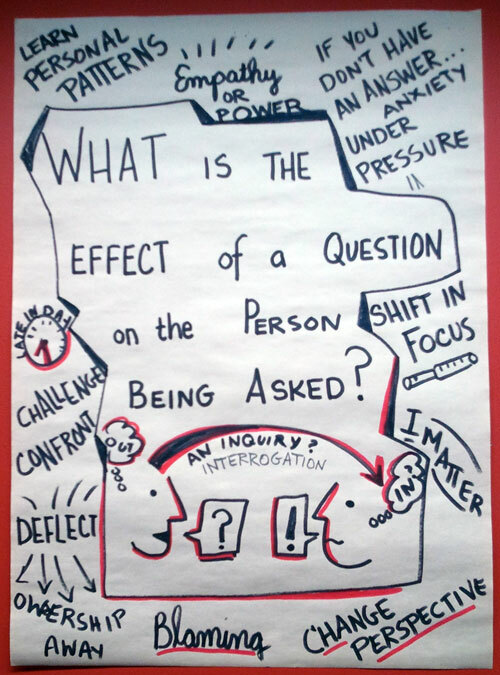 What is the effect of a question on the person being asked? 3. What kinds of questions have potential to engage a better experience? Albeit not as silly as the first challenge it became apparent that there are many facets to fully understanding questions. For example, when characterizing the question being asked we sometimes look at the energy or enthusiasm of the person asking, the scale of the real problem being addressed or even the age of a person taking the lead. For instance, if the person is younger there might be more time to solve the issue, whereas, if that person is older they might have more knowledge to bear. Questions might be mere inquiries, examinations or research. They might be asked in an exclusionary or an inclusive way, and depending on how we view the question it will affect how we answer. There were many more ideas that came out of this challenge, too many to mention but it suffices to say that these were simple questions that produced a lively debate. By the end of this challenge it was obvious how creatives could better use this knowledge to build better opportunities with their clients. Dialogue sketch composed by Patricia Kambitsch. The third challenge produced a plethora of ‘post it notes’ that covered many different questions from the audience as noted in the picture are below. In the end I realized the most important thing to do is ask the right question. Far too many people have an answer already in mind when they ask, or the question they ask is too vague. I know in the future the way I ask and the way someone responds is something I will be looking at more carefully. This entry was posted on 2011.10.20 at 5.07 pm and is filed under Organizational Thinking. You can follow any responses to this entry through the RSS 2.0 feed. You can leave a response, or trackback from your own site.